Share the post "A Handy Solution To Formatting Woes"
Most power users feel compelled to format their S60 devices after a few months of usage as the phone gets too cluttered with the applications they have installed. However what holds them back is that fact that reinstalling all the apps they need after the format is a pain. After a firmware upgrade also we face the same problem. A friend just IM’d me this wonderful freeware application called InstFast that helps install multiple applications in one go with a minimum of dialog boxes! Unfortunately I couldn’t find out anything about the developers. It works like a like Batch Installer. You select a bunch of Apps, place them in a folder and it will Install them all at once with Minimal Installation Pop-ups! Supported files include sis, sisx & jar. By default the path is set to a temp directory but you can select a particular location. It also allows you to decide whether you want to install in the Phone Memory or the Memory Card. Very neat! 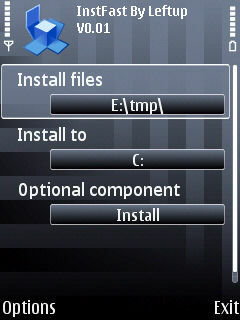 You will need to sign it with your developer certificate from symbian signed before installation. Previous PostRun WinMo .Net Based ApplicationsNext PostWishing You A Very Happy New Year & Site Updates! hey if u any of u still have this app can u upload it again?? ?